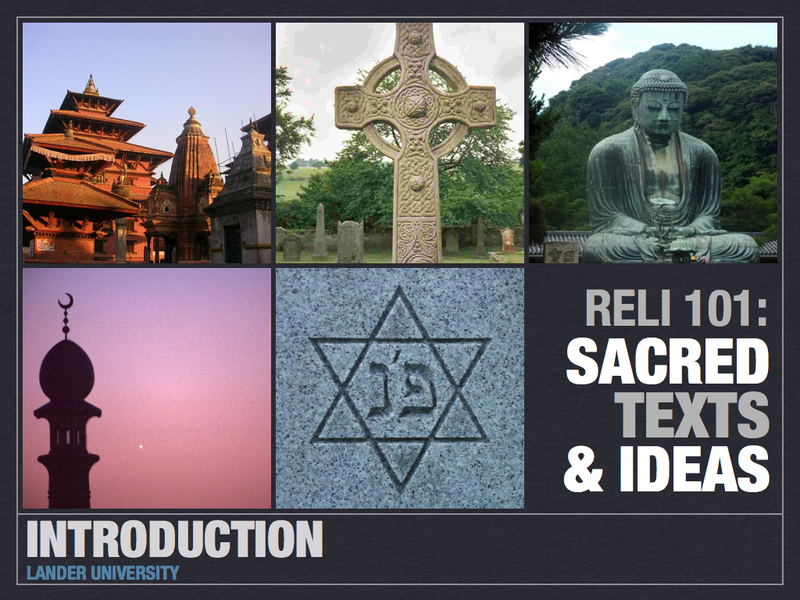 I’m teaching RELI 101: Sacred Texts & Ideas at Lander University again next semester. The time for the class is Tues-Thurs from 1:15-2:45. I’ve had some questions about the course, so I thought I would provide some answers this morning. What does “Sacred Texts & Ideas” mean anyway? I didn’t come up with the title, in fact, before me, no one had ever taught the class at Lander. It’s basically an introduction into religion, faith, and the scriptures of differing faiths. Its an intro to fundamental religious thought. Is it easy? That depends upon how you define easy. I am fair, and the class is spelled out. I used to hate classes where I didn’t know what to expect from professors, so that is why I spell everything out in the beginning. My two previous classes would say it was interesting and you know what’s expected of you. Most people got really good grades. What do you cover? In addition to faith, the concept of God, arguments for the existence of God, the nature of Scripture, we also look at five major world religions and their scriptures: Hinduism, Buddhism, Judaism, Christianity, and Islam. What does it count as? It can be a general elective, but if you get a course substitution form and work with your advisor, it can count as a humanities elective. I don’t know if I can take it this semester, will you teach it next year? Possibly. I didn’t teach it this semester due to Lander having to cut most adjunct faculty due to budget reasons. So if they ask me to teach it again, I will teach again. If they ask me to teach something else, I’ll probably do that as well. As long as its not math. Wouldn’t be too good. Is there a project? The big assignment of the semester comes towards the end of the class, and its very simple. You must answer the question “Why do you believe what you believe?” You don’t receive grades due to what you believe, your grade will come out of can you articulate why you believe that way. Answers such as “that’s what my mom taught me,” or “I grew up that way” do not suffice. You have to really do some soul-searching and some study for this deal. Students love this project. It is challenging, but you come out way stronger in the end. Hope that answers your questions. If you have any more, feel free to comment and I will answer them for you. Hope to see you there!